In 1314, Clement V, the first Avignon Pope discovers the special soil of Châteauneuf-du-Pape. His successor, John XXII supports him and it was during his reign that the vineyard really takes off and spreads fame beyond the borders of “The Comtat”. The former bishop of Avignon, Jacques Duèse was elected as Pope John XII and succeeded Clement V in 1316. He regularly drank the wines from the vineyards ‘in the north’ and did much to improve viticulture practices there. placed directly under his authority. He oversaw the total construction of the castle, which began in 1317, and was completed in 1333. 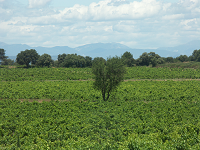 Grapevines and olive trees were planted in the area. According to the archives of the Apostolic Chamber, the total number of grapevines at Châteauneuf was estimated to be more than three million in 1334. This represents 600 to 800 ha of vineyards. Under John XXII, the wines of this area Orders renewed each year until reaching over three thousand liters per year. During the festivities the wine was served to ambassadors and other representatives of foreign courts and soon afterwards even shipped in barrels to Italy, Germany and Britain.